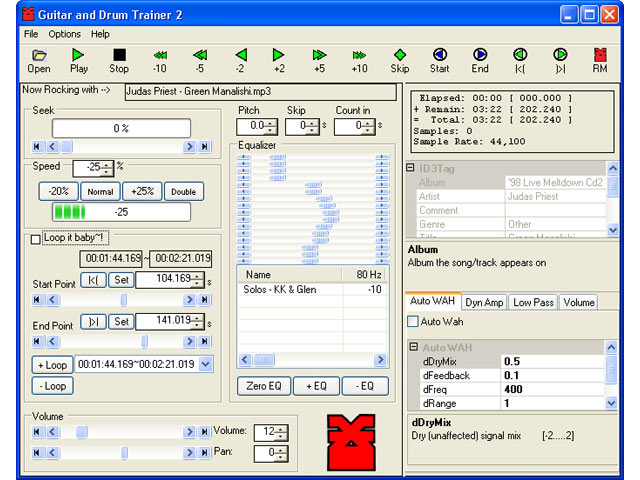 UDM Downloads > Guitar & Drum Trainer! Play any instrument better by getting more out of your practice time. Easily learn your favorite songs and music on guitar or any instrument with GDT. * Slow down music without changing pitch * Pitch shift music to match your instrument * 16 band EQ and Low Pass Filter to cut out unwanted parts and boost what you want to hear * Loop music to listen to the same part again and again * Stereo panning to listen to solos in either channel * ID3 tag, OGG tag, file info displayed * Precise time, position and sample info accurate to 1000th of a second * Easy controls you can click, scroll, type, or use your mouse wheel * High-quality sound * Play MP3, OGG Vorbis, and WAV files * Save songs configurations This award winning software lets you easily slow down songs and music without changing the pitch so that you can learn new songs and music on your guitar or any other instrument. Convenient looping features let you listen to the same part over and over. You can even skip to the start or end of a loop instantly. You can pitch shift your MP3 music to match your instrument (change musical keys), so you never need to tune your guitar or instrument to match a song - make the song match your instrument. Time and position information is given for elapsed time, remaining time, and total playing length. The superior time and position also displays time in HH:MM:SS, SSS.sss, and in samples. Even the sampling rate is displayed for you. You can easily seek and skip around inside of songswith convenient skip buttons and a seek bar. Save multiple loops, multiple EQ settings, and save song configurations for later use. Find out why GDT is award winning software that musicians rave over with a free no-risk trial. Visit http://renegademinds.com/Default.aspx?tabid=65 for more information or support. For guitar, bass, drums, keyboards, piano, trumpet, cowbell, triangle and more!